I am visiting my friend’s house for dinner tonight. They have bought a new house and settled into it now. It is an informal house warming dinner that they are hosting. I have bought a gift and made a Indian dessert called Carrot Halwa. To go with it, I made a card as well. Thought I will share the card with you. I have used This Awesome House stamp set from Winnie & Walter to make my card. 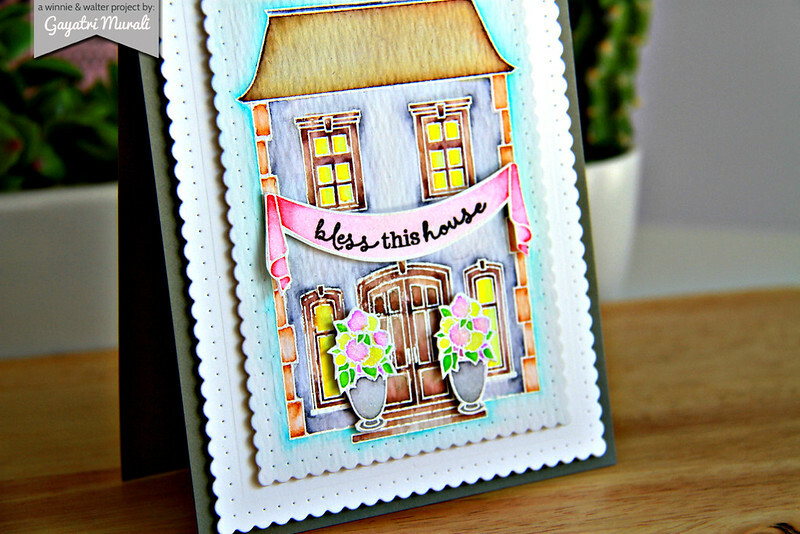 I heat embossed the house on watercolour card stock in white and water coloured using Zig Real Brush markers. Then I used Essentials: Audrey Cutaway to die cut the scallop panel. I also white heat embossed the banner and the flower pots, wate rcolured them and cut them out. I adhered the flower pots and banner are popped up using foam adhesives. The sentiment on the banner is also from The Awesome House stamp set. I die cut another scalloped panel using Essentials: Audrey Cutaway using white cardstock and adhered on an grey card base using foam adhesive, similarly the house panel on the larger scalloped panel using foam adhesives. I have brushed the banner and the flowers on the flower pot with Wink of Stella. I love the soft look of the watercolour house and flower pots and banner with the sentiment in black for a nice crisp contrast. This draws the eyes to the sentiment. I love how this card turned out. Hope they do too.